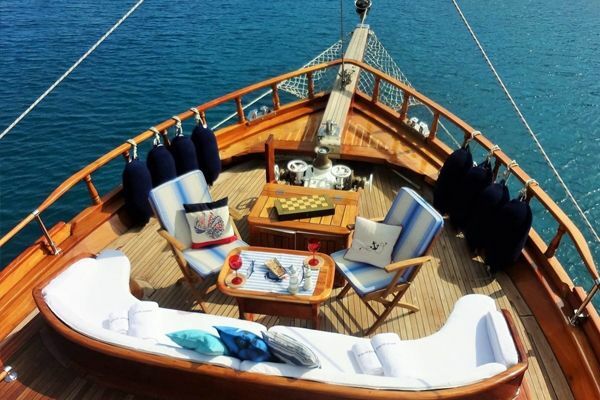 To cruise aboard the elegant Deluxe ketch gulet Esma Sultan is to enjoy a very pampered luxurious cruise along the beautiful Turkish coast and among the nearby Greek Islands. 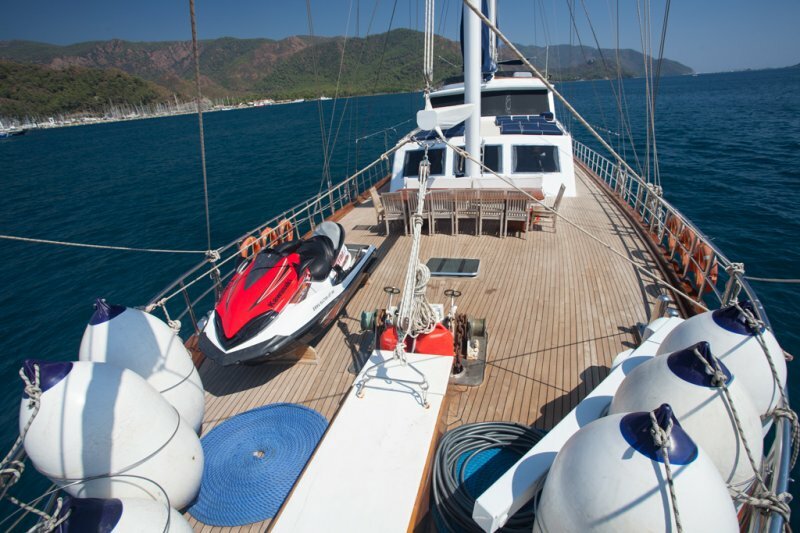 The unique architecture of the yacht, the flybridge and the splendid interior of this classic gulet has blended the best features of gulets with the ultra-comforts of a motoryacht. 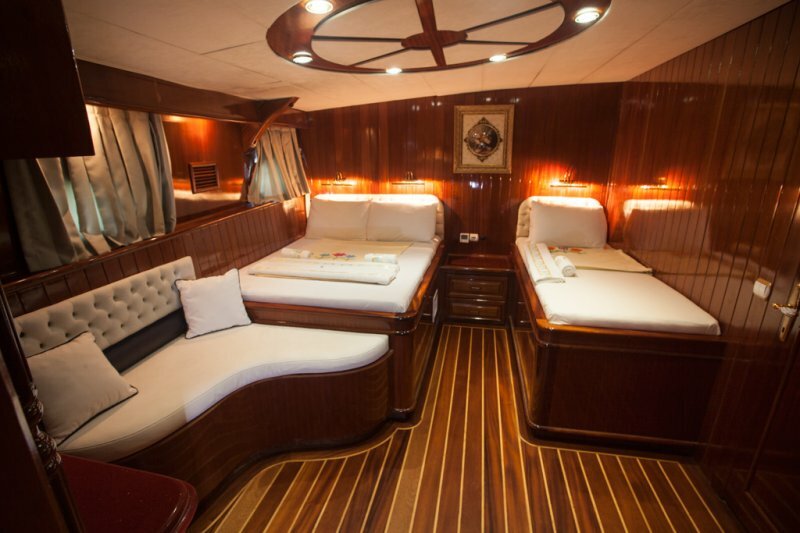 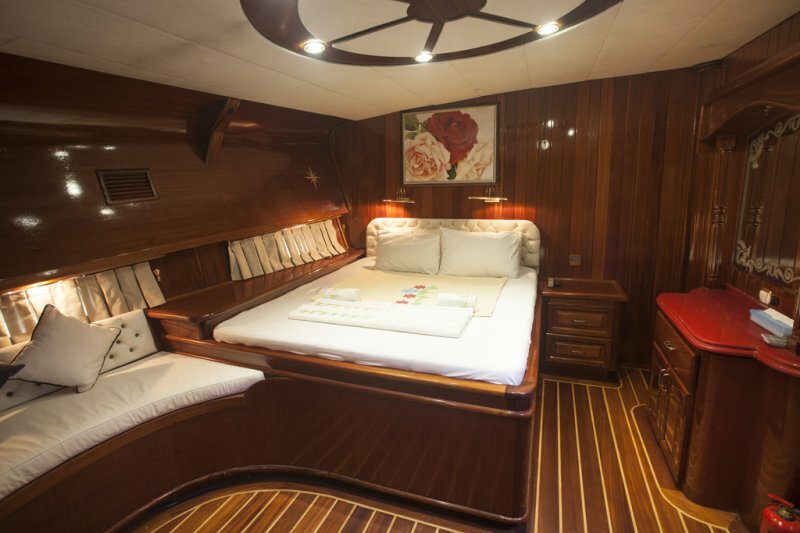 The luxurious aft master cabin enjoys the ample space afforded by the full beam width of the gulet – with the round, angled king size bed, a make-up/writing table, a settee, and the whirlpool bathtub which is integrated into one side of the cabin. 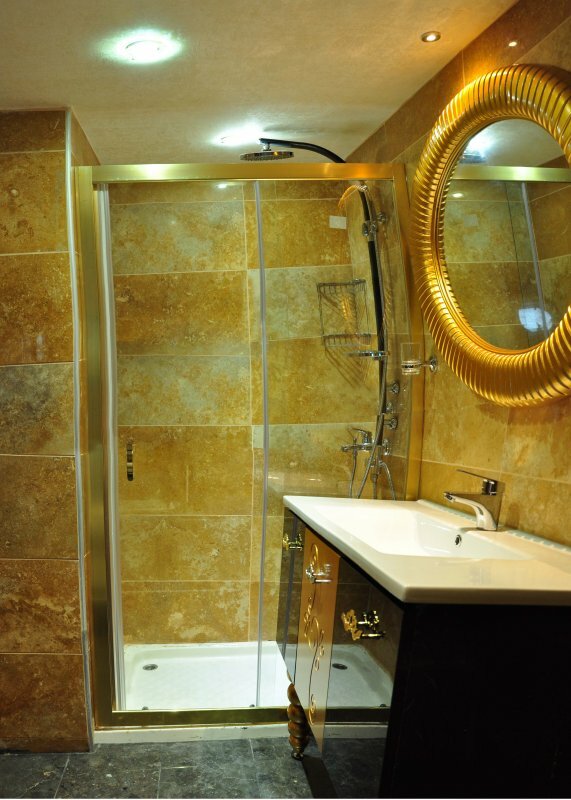 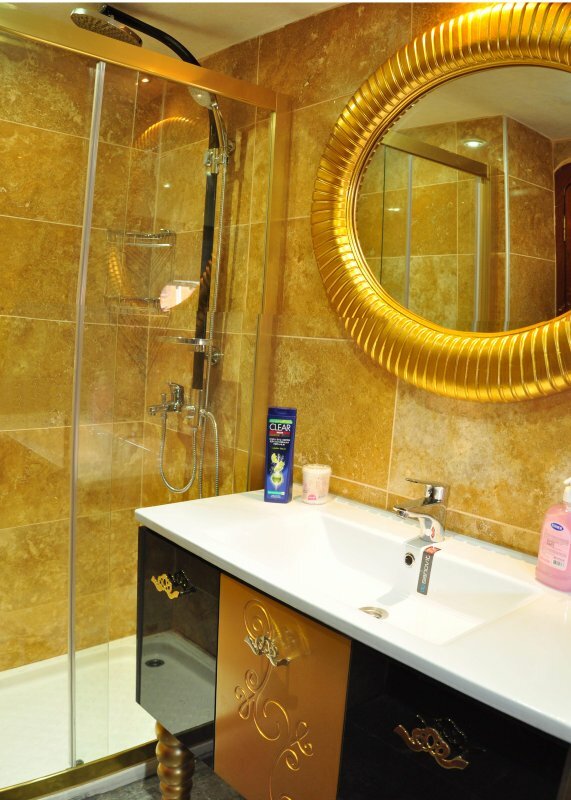 Plenty of storage and the private marble lined, fully fitted bathroom complete the luxurious comfort for guests. 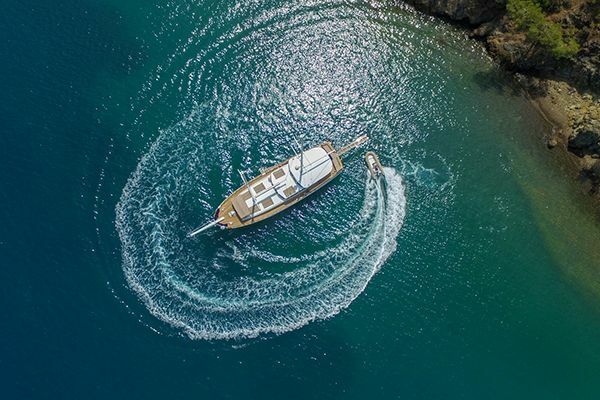 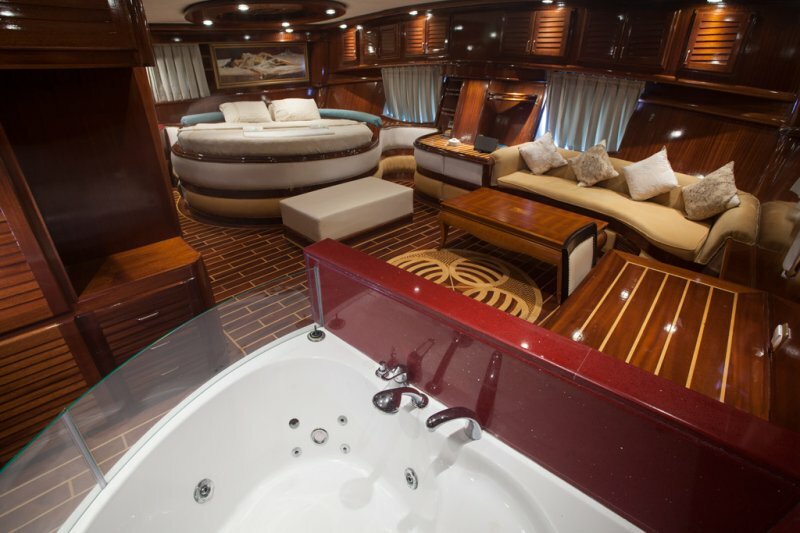 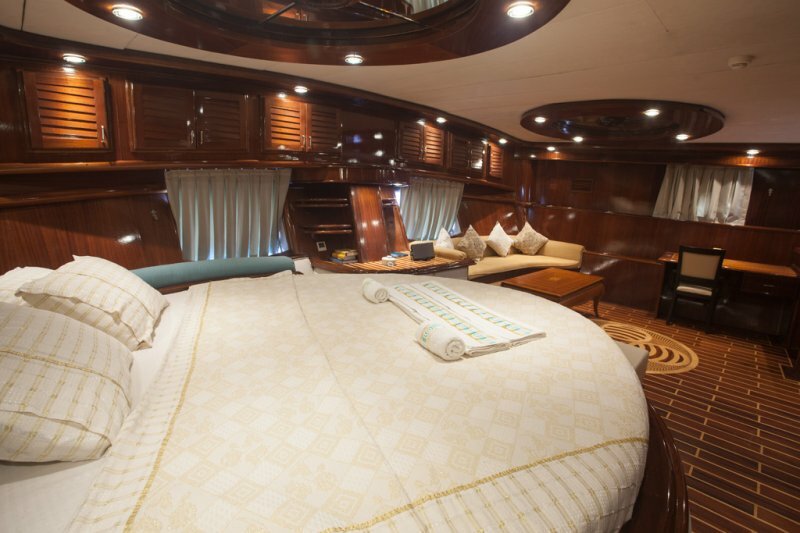 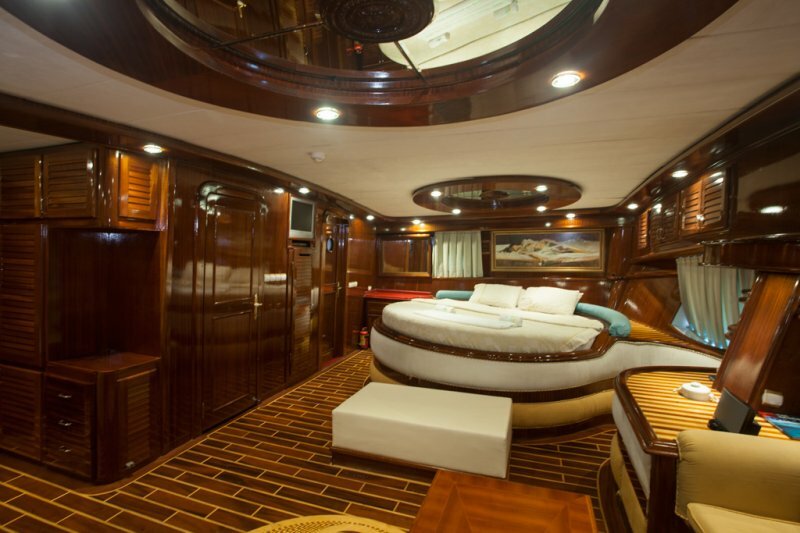 The long 40m hull allows generous space for the four double bed cabins and two cabins with a double and a single bed, and all offer full guest comforts with side seats, storage, televisions, an ensuite private bathroom, and all have air-conditioning available. 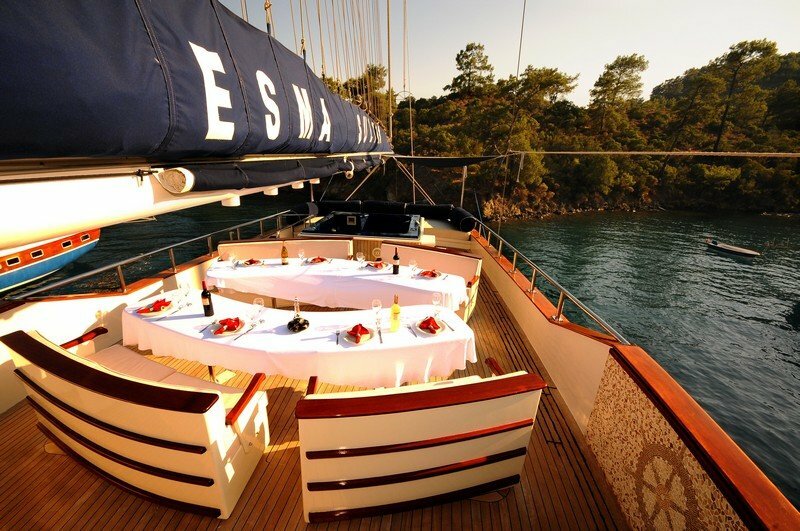 The custom design of this ketch gulet Esma Sultan features the light-filled saloon integrated into the deck structure as two separate units. 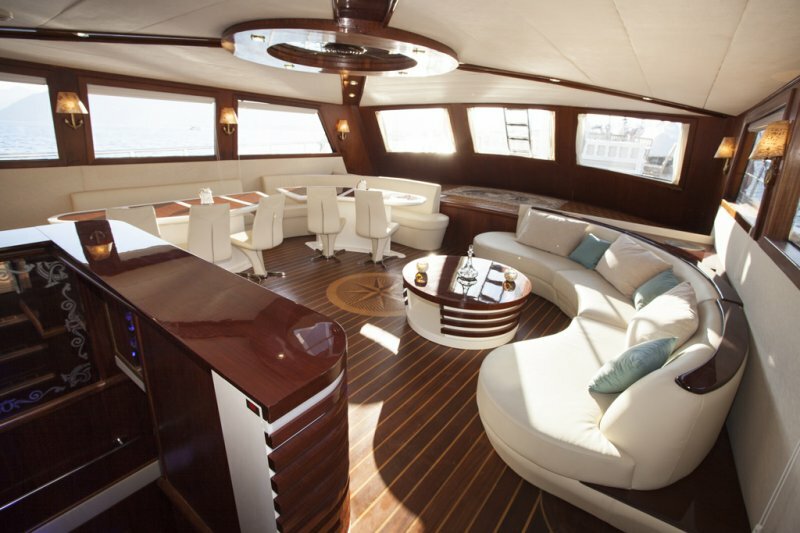 The upper saloon towards the bow has a small but sumptuous seating lounge with a low table and two separate, curved tables with curved long leather-covered sofas ideal for meetings, cosy gatherings or entertainment with the large screeen and music system. 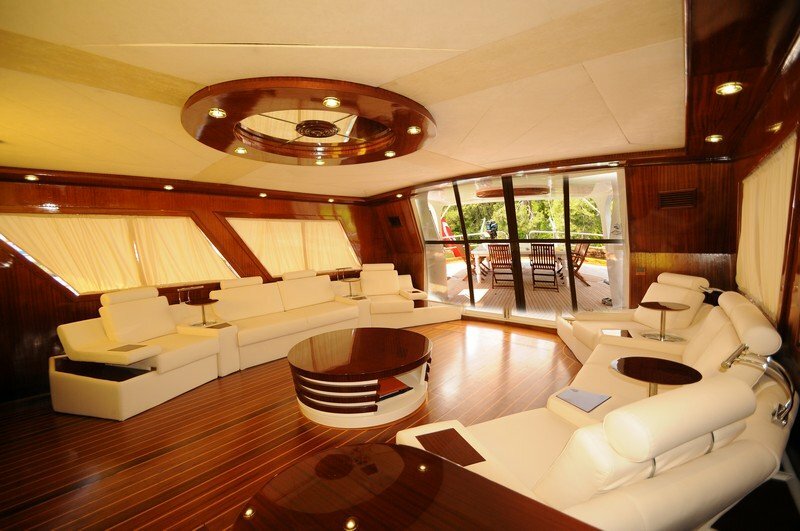 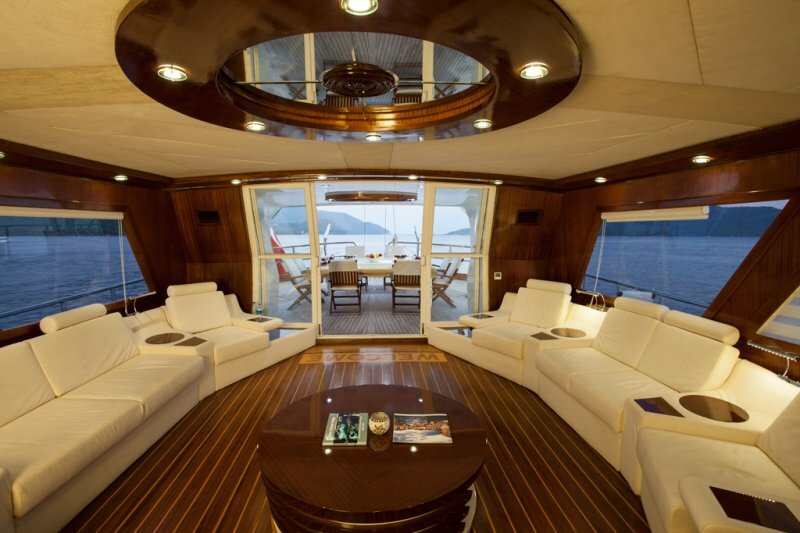 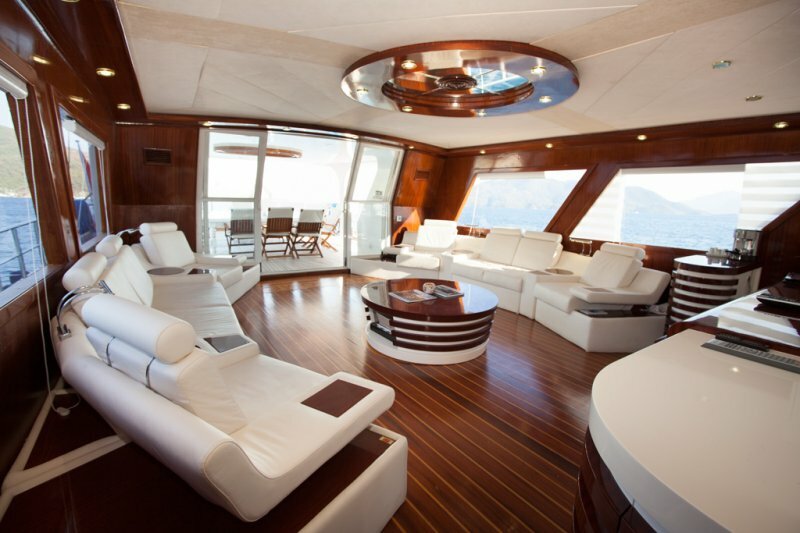 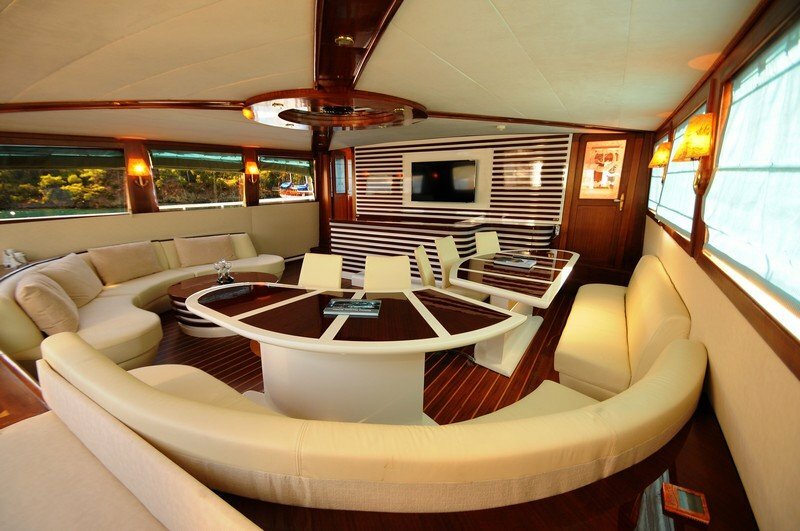 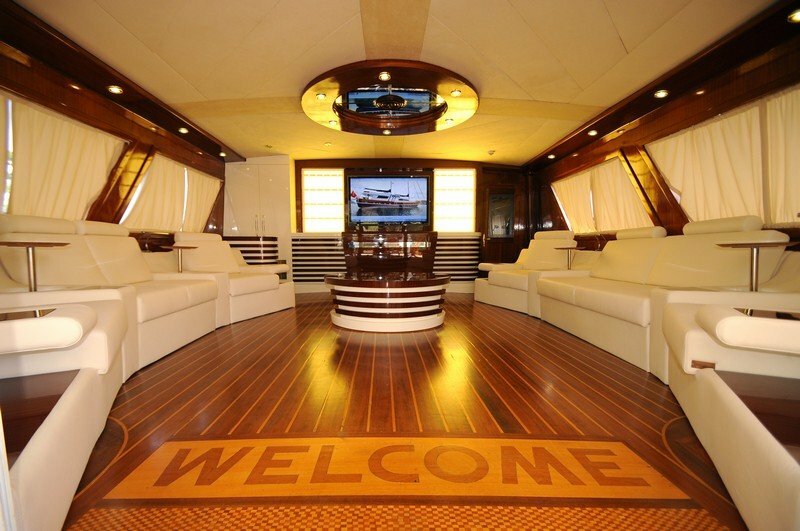 The larger saloon towards the aft is perfect for entertaining with open space between the two facing long couches of white leather with a small coffe tables, and a large console for the television and music entertainment system. 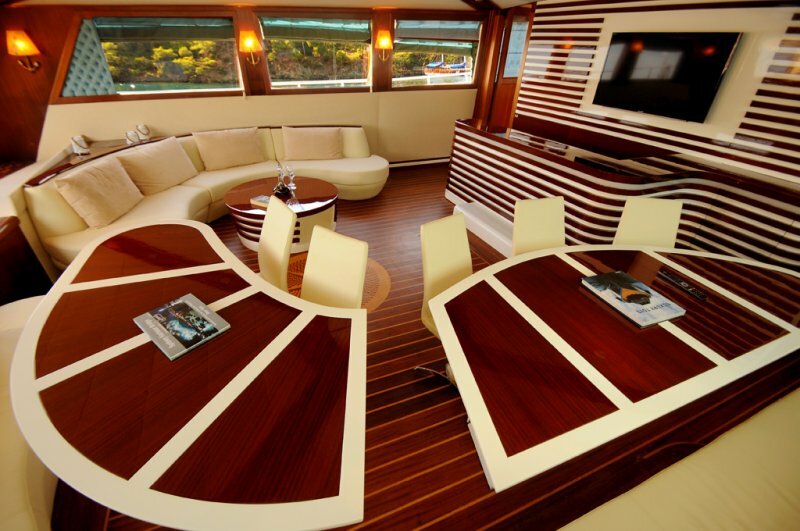 The combination of polished mahogany and white leather pads gives the entire saloon an avantgarde atmosphere. 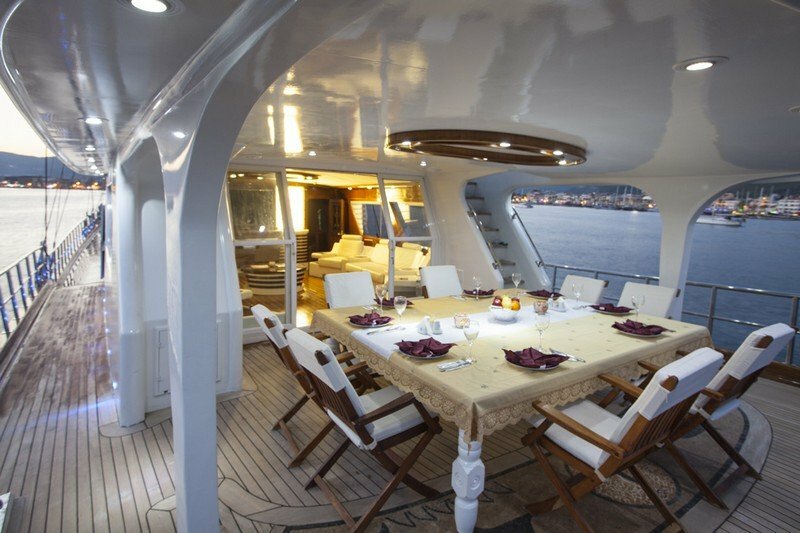 Full length glass slidingdoors opens the main saloon onto the spacious aft deck, where a large dining table offers the pleasure of enjoying delicious meals outdoors. 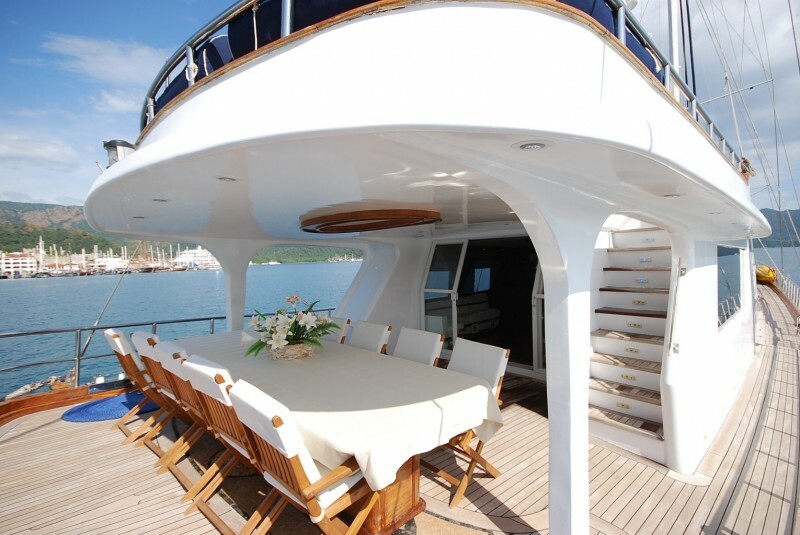 Set under the upper deck for good shelter and lighting allows for either a formal or informal setting. 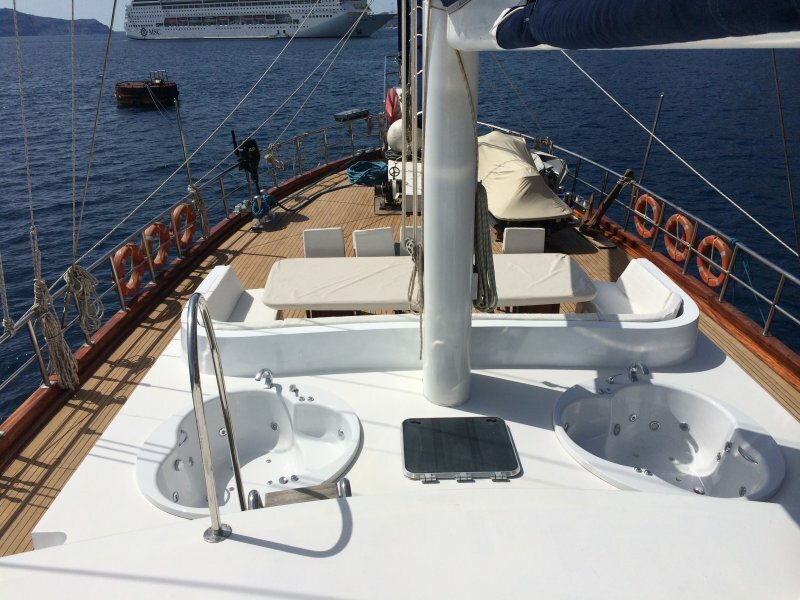 On the foredeck towards the bow another long table is to be found in front of a long seat bench, while on the middle deck behind the mast are the two inviting small jacuzzi to relax in, close to the individual sunpads. 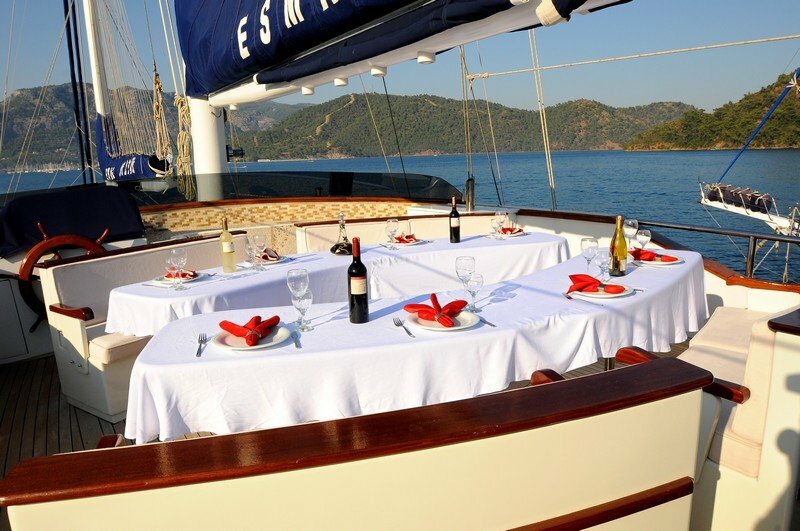 Sitting at the bow of the yacht with a sundowner while the sun sets at the end of the day is an experience not to be missed. 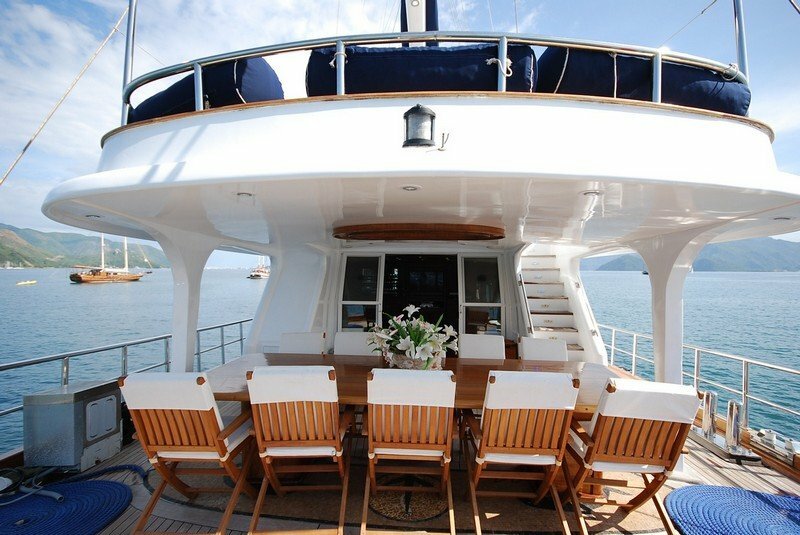 Another highlight of luxury yacht Esma Sultan is the upper deck or flybridge, gained by a small staircase from the aft deck. 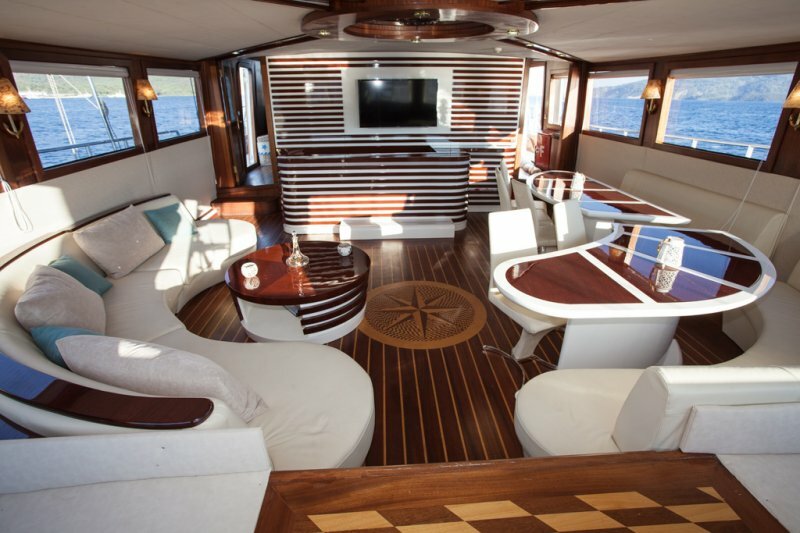 Here are two curved tables with seats each facing each other and a wide comfortable cushion pad aft to laze upon to enjoy the magnificent views while the gulet moves along the beautiful coast-lines of Turkey or the Greek islands. 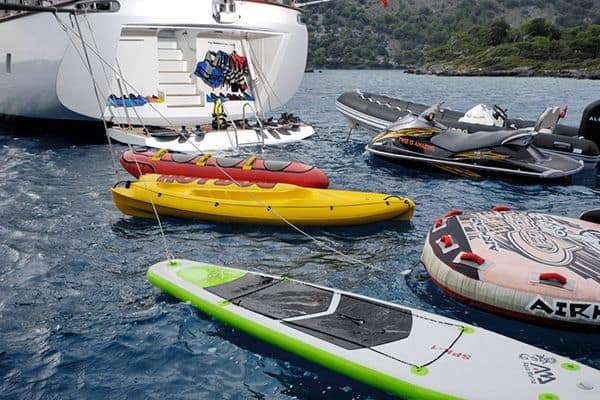 A full list of watersports toys, wakeboard, waterski, ringo and jetski are also available, with assistance by the crew. 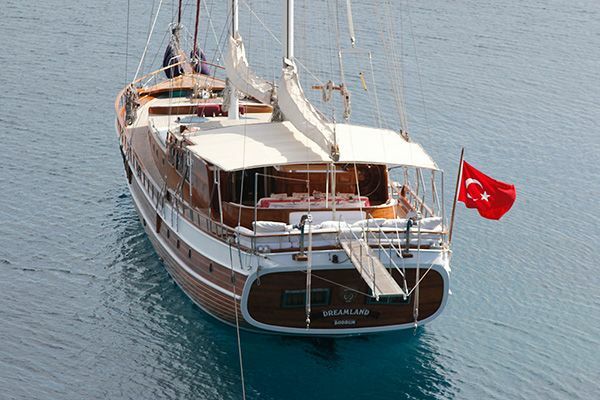 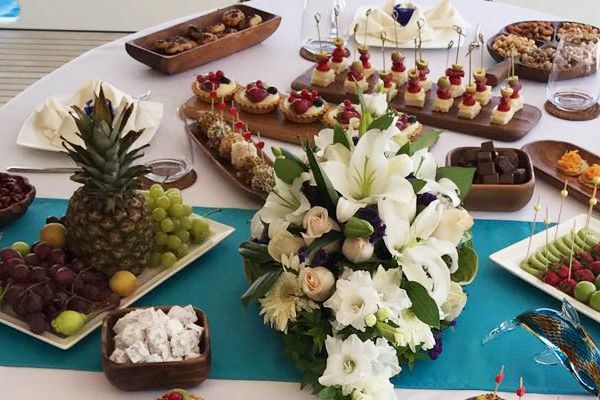 The elegant 40 meters gulet Esma Sultan is perfect for people who like to be pampered by the professional crew of six and the captain – the crew is trained to handle all tasks aboard and the cook is master of all the excellent meals freshly prepared in the galley. 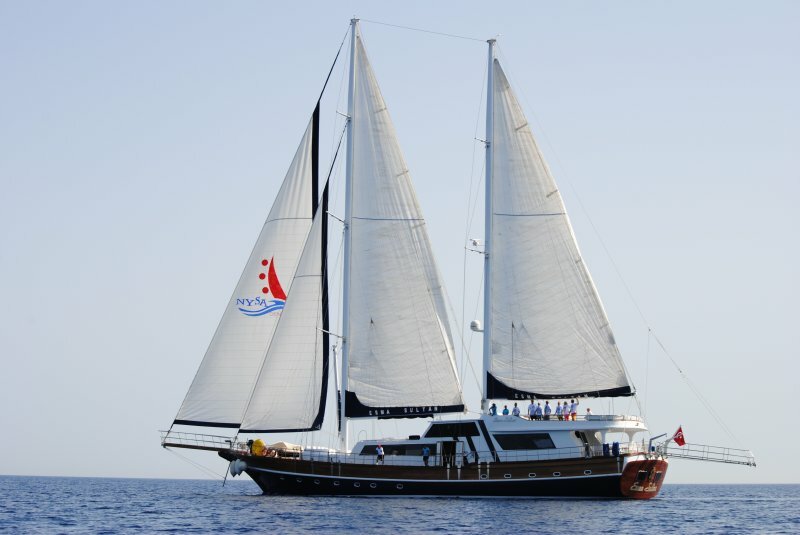 The captain knows all the incredible bays, interesting vllages and tiny, idyllic coves hidden on the Mediterranean coast and the Greek Islands, to create a memorable gulet cruise holiday.